This Cat Train Newsletter is on the second cat that was sunk with the D6 9U known as the "BISMARK" which was issue #15 and #16 of the Cat Train Newsletters. So to recap the sinking story, Kip's son and hired man sunk 2 D6 9U Caterpillar cats when Kip was at a sportsman's show in the USA promoting his lodge. Kip was telling me that it is not a good phone call to get when you are so far away and unable to help. When Kip returned home after the sportsman show he was unable to recover the 2 sunken cats due to the melting snow conditions of late spring. It is hard to believe that 2 cats were sunk together but that is the joys of mother nature, so I'll briefly tell the story. With Kip at the sportsman show in the USA, his son and a hired man ski-dooed out 70 miles from Ilford, Mb to the lodge. 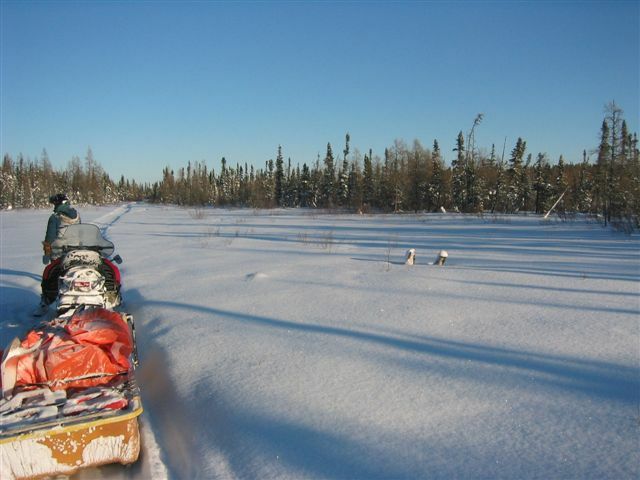 They were able to get 2 D6 9U cats running and then they hooked up the sleighs and headed back to Ilford, Mb. Everything was going good until they crossed a swampy area in which the lead D6 9U cat crossed with ease but the second D6 9U broke through the thin frozen crust. The first D6 9U to sink has now been named "THE HOOD" by the King of Obsolete since I name all my cats. The first cat to cross the swamp now sees the sunken cat in the swamp, so the operator unhooks the sleighs and returns to help the sunken cat. But this is when the cat (which I have now named the "BISMARK") sinks in the swamp to joins the other cat now called "THE HOOD". So with 2 cats sunk in a frozen swamp the operators return to Ilford, Mb and await Kip's return from the USA. Kip arrives on the scene of the sunken cats and tries everything that 40 years of winter freighting experience has taught him on how to salvage the sunken cats. But due to the late spring conditions, Kip is wise and aborts the salvage mission before he sinks any other cats. The 2 D6 9U cats will be in a watery grave for 3 years until they are salvaged by a hydro line crew with a 50 ton crane. Kip gets the 2 salvaged cats back to Ilford, Mb where he realizes that they are too far gone with damage from 3 years under water. The poor cats "sit with out love" for 8 long years until the King of Obsolete is given Thompson collection. The first thing I did when I arrived in Ilford, Mb to get the collection ready to be shipped to the KINGDOM in Lynn Lake, Mb was to pour diesel fuel down every open hole on the cats. So with the writing of the Cat Train Newsletters, I have named the sunken cats the "BISMARK" and "THE HOOD" from the World War II battle of the big gun battle ships. Last winter I worked on the D6 9U known as the "BISMARK" and wrote two newsletters on the repairs, now this winter I have worked on the D6 9U known as "THE HOOD". So now that I have explained the history of the sunken cats, I'll now tell the story of "THE HOOD". 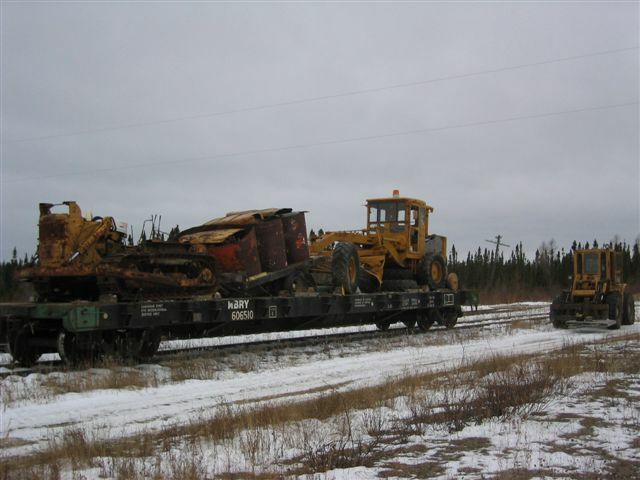 I traveled to Ilford, Mb in late fall of 2004 to load "THE HOOD" on a railcar to ship him out because I can't wait for the winter road to open in January. This is a simple project, load the "THE HOOD" and some other collectables on a railcar, then unload them in Thompson, MB. But the railroad has other plans, a 4 hour trip by train now takes 3.5 weeks plus lots of other problems too! First, I'm loading the railcar and have "THE HOOD" and other collectables sitting on the railcar and go for a quick lunch. When I return after lunch, the railcar is gone, the train stopped and picked it up without any release papers or authorization. This is not good. "THE HOOD" and the other collectables are not tied down and if the train stops quickly "THE HOOD" could roll off the railcar to be scrap metal for sure. So, I phoned the railroad and tell them what has happened and then they get the train to return with my collectables. But since I complained on the train crew, they return "the favour" and spot the railcar a 1/4 mile from where I was working. Nice guys! Now I have to haul all my tools and stuff to the railcar to finish tying my collectables down. So now that I have complained on the train crew, they come up with every excuse in the book why my railcar of collectables is unable to be moved on the next train. One of the excuses was that my cables for tying down were too loose, but they took the car on a 30 mile trip with no cables or tie downs, some excuse! So after 3.5 weeks of phone calls and re-adjustments my railcar of collectables finally arrives in Thompson, Mb in a record snow storm. Buddy Barry and I are really having fun trying to unload the railcar and get "THE HOOD" and collectables on to Barry's semi trailer. Now if the railcar arrived 3.5 weeks earlier, we would have been doing the unloading and loading in short sleeve shirts. The joys of deals with a company that thinks their "God" and have no idea what customer service is! Now that buddy Barry and I finally got "THE HOOD" and the collectables home to the KINGDOM in Lynn Lake, Mb during a record amount snow fall for the Great White North. I then get on the internet and start ordering parts from my friend Ed in Washington state. (he sent me the parts I needed for the "BISMARK"). I then decide with the record amount of snow fall already in the Great White North, I should get the little cats up and going first because they are better on the "not so frozen ground" due to the deep snow insulating the ice. So "THE HOOD" will have to wait until February to go into the shop for a complete tear down to see what 3 years in a watery grave plus 8 years on surface with no love will do. The next issue I'll be telling about the complete tear down of "THE HOOD" plus "the elephant" that sat on the hood that covers the engine compartment. PART 2 OF "THE HOOD"
PART 3 OF "THE HOOD"